Everyone’s heard that body language is important – it really does affect how others perceive you. But did you know your own body language can affect how you feel? Your posture can have a surprising effect on self-confidence and performance. By now, you may have heard of power posing. If not, here’s a brief primer: A joint study from researchers at Columbia and Harvard University found that certain “power poses” cause changes in hormone levels that lead to higher confidence and overall better performance. People in positions that were more open, relaxed, and expansive had these positive changes. More precisely, striking power poses increased testosterone (linked to increased self-esteem and confidence) and decreased cortisol (linked to stress). People in more closed off or slouched positions were found to have lower confidence, decreased feelings of power, and less likely to take risks. So just how do you do these power poses? Generally, you should try to take up more space, but also remain relaxed. When sitting, lean back in your chair, raise your arms with your hands laced behind your head, and prop your legs up on a table. Alternatively, stand with your legs apart and your arms resting on your hips or on a table in front of you. You should avoid hunching over a smartphone or crossing your arms. So what does all of this mean for you? Being more aware of your own posture and body language could help you improve your performance at work. 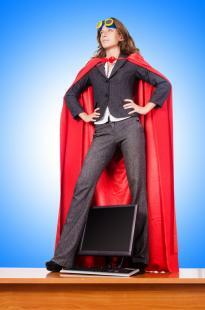 Before or during a big presentation, strike a power pose to boost your confidence and lower your stress levels. Stand up tall with a power pose. If you feel better, you will perform better. Have an important meeting at work? Remain relaxed, open, and confident with a power pose. Changing your body language is a simple and quick way to help yourself. It doesn’t take long — holding the pose for just one minute can lead to these positive effects. So before your next big presentation take a minute just to collect yourself, strike a pose, and empower yourself!